Leonard, David W.. "Vermilion". The Canadian Encyclopedia, 24 May 2018, Historica Canada. https://www.thecanadianencyclopedia.ca/en/article/vermilion. Accessed 26 April 2019. Vermilion, Alta, incorporated as a town in 1906, population 3930 (2011c), 4036 (2006c). 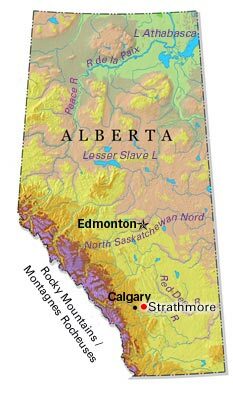 The Town of Vermilion is located on the Vermilion River 190 km east of Edmonton. Vermilion, Alta, incorporated as a town in 1906, population 3930 (2011c), 4036 (2006c). The Town of Vermilion is located on the Vermilion River 190 km east of Edmonton. Although squatters occupied land near the river in the late 1890s, it was the Dominion Lands Survey of 1902 which ushered in a wave of homesteaders to the area. A small settlement called Breage soon emerged but was moved several kilometres west with the coming of the Canadian Northern Railway in 1905. The settlement was then named Vermilion (Cree for "red clay deposits"), after the river, and grew so rapidly that it was incorporated as both a village and a town in 1906. 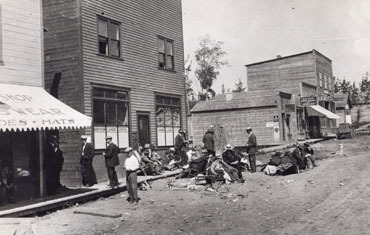 Although a fire wiped out most of the business district in 1918, Vermilion has remained the prosperous centre of a rich mixed-farming district. The town's major attraction, the Vermilion School of Agriculture (since 1975, Lakeland College), has offered training in agricultural science since 1913. S. Carl Heckbert, Vermilion Memories (circa 1976). VermillionOfficial website for the Town of Vermillion, Ab.